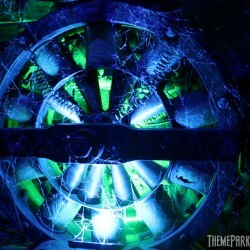 Remix is in House of Horrors, a year-round haunted attraction at the theme park, guests will already be familiar with the environment of the maze. Many of the sets, props, and monsters remain the same, but surrounded by the flashing, colorful lights and pounding music. It was interesting to say the least! 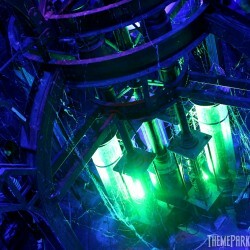 Although Universal Monsters Remix is nearly identical to its year-round operation as House of Horrors, there are changes inside the maze that is noteworthy for this year. In the hallway with the body bags, the projection of the zombie silhouettes is completely replaced with a brand-new scene with an actor! 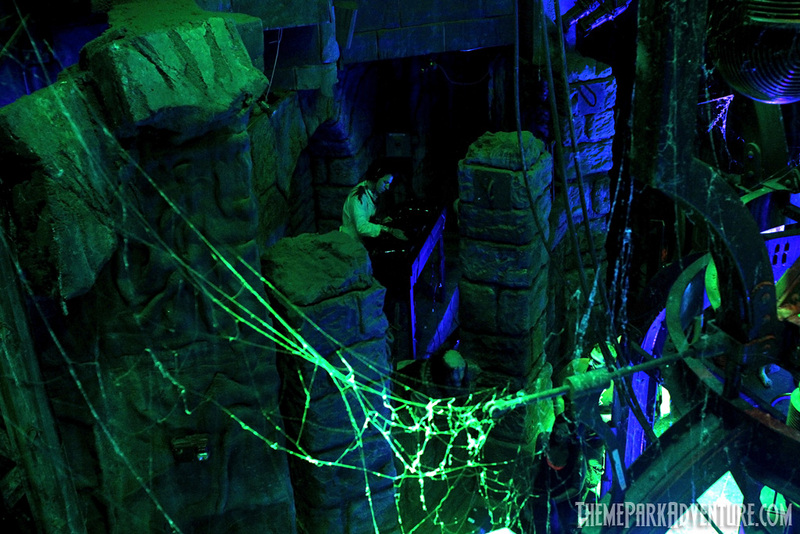 It looks great – very eerie – since the scene is far enough that guests act as “spectators” while the zombie is eating his “lunch” and staring at you! Very creepy! For a maze that focuses its design with music, it is inconsistent while walking through. While the key scenes have loud, pulsating music with bright lights, the rest of the maze is left with softer sounds that completely derails the experience. In the finale room at Frankenstein’s Laboratory, it is almost like a dance club! There is a go-go dancer played by Lily Munster grooving to some tunes by a DJ while Frankenstein danced around him (never thought I’d see this happen). 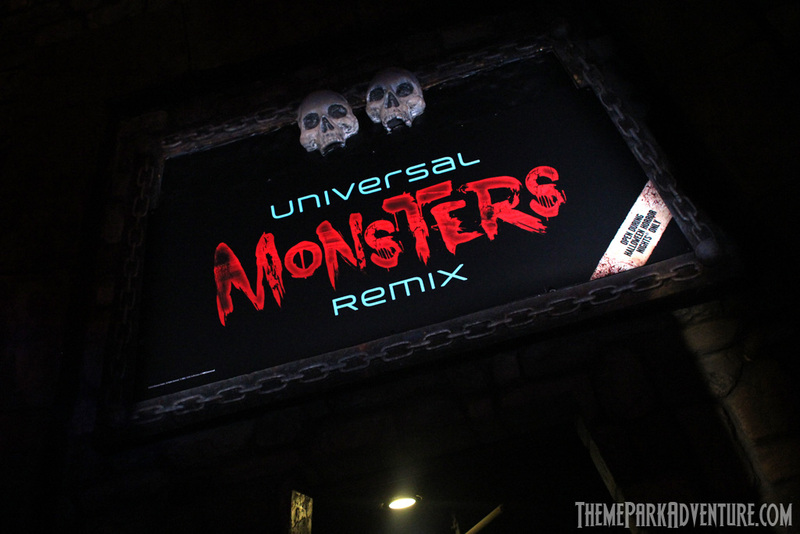 While we understand the idea of Universal Monsters Remix and what the team at Horror Nights wanted to accomplish – the bottom line is that it wasn’t scary. While going through the maze, we did not see one guest actually be frightened because they were too busy dancing. We love Halloween Horror Nights because they’re not afraid of being terrifying. We also understand that House of Horrors is an already in-park attraction and makes it hard to re-do during the Halloween season, but let’s hope for next year that it will get an overlay that it deserves! 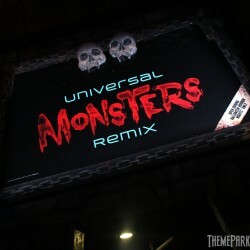 This entry was posted in Haunted Attractions, Home Page and tagged Halloween Horror Nights Hollywood, Universal Monsters Remix, Universal Studios Hollywood. Bookmark the permalink.